Consulting is a consistently one of the hottest industries for MBAs. Each year over 1 in three students from top schools such as Columbia, MIT, INSEAD, and Northwestern accept positions in consulting. This is an industry of a few firms dominating the MBA hiring scene – for example, the big three (McKinsey / Bain / Boston Consulting Group) alone hired 18% of Dartmouth’s class of 2015. While other opportunities can be overpowered by these big time firms, a passion for consulting can lead you to many different industries. Although many available positions lie within M/B/B, there are other industries and unrelated firms that hold opportunity for consultants as well. To find examples of non-consulting-focused firms that still offer consulting positions, visit the Consulting Function Dashboard. A career in consulting not only offers a large paycheck – it also provides variety and challenge to MBA graduates who will work with any number of different companies, industries, and locations. An analysis of the 250,000+ data points at TransparentMBA offers a peek into the intriguing world of consulting. The average salary for an MBA graduate in consulting is in the 97th percentile at $142,273. While the average stock compensation is negligible, signing bonuses average a generous $22,850 (89th). 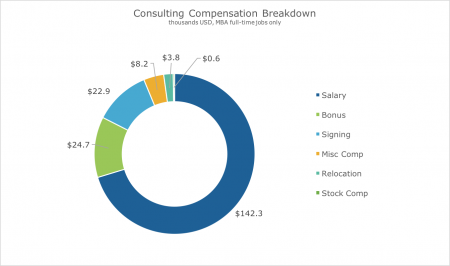 All together, the average starting total compensation of an MBA graduate in consulting is in the 74th percentile at $202,454. Remember when we mentioned that MBA graduates in consulting will work in any number of different locations? That wasn’t an exaggeration. The percent of time spent traveling for an MBA graduate job in consulting is twice as much as other industries, at a whopping 52%. If that number seems too high for you, KPMG with rates of 40%. In contrast, practices like Ernst & Young LLP or A.T. Kearney can reach travel percentages of 80%. Overall, an MBA graduate in the industry can expect to work and travel an average of 59 hours per week and will likely be based in large financial centers such as New York, San Francisco, Chicago, or in one of the 30+ countries that large firms have offices in. 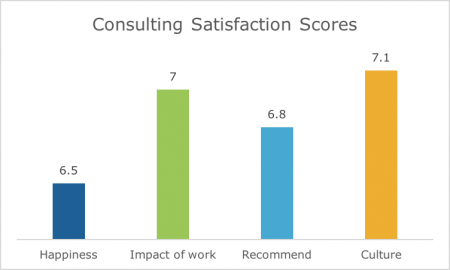 MBA graduates in consulting don’t seem to mind the demanding work schedule, as satisfaction scores are favorable. The average happiness score of 6.5 out of 10 is only slightly below the average for all other MBA grads, and all other satisfaction indicators rank above average. For example, culture scores an average of 7.1/10 points and impact of work received 7/10. Additionally, the industry is home to plenty of firms who receive perfect 10/10 satisfaction scores across the board. Some of the high impact scores may be attributed to the fact that MBA graduates in this industry are contributing to firms that have experienced double digit growth year after year. Training and feedback, both formal and informal, are also on the rise at consulting firms. Job based training sets MBA graduates up for greater understanding and success, while informal mentorships and feedback foster supportive relationships and workplace culture. MBA graduates in the field also have favorable feelings towards promotional policies and their ability to progress in the company, and many M/B/B employees transition into the C-Suite or leadership roles of outside firms. To learn more about employee satisfaction in the industry, visit the Consulting Dashboard. Workplace satisfaction is also high among interns, who reported above-average scores in 3 of 4 indicators. Their recommendation and culture scores even ranked higher than their full time peers. Interns work only slightly less than full timers – 57 hours per week with 51% travel – and receive a total compensation package of about $30,000 more than MBA interns in other industries. Most MBA internships in consulting are summer associate positions, and most offers are received around February. The path to a consulting internship with many of the large firms follows the same basic process. MBA students will start out by attending an informational presentation or mixer on their campus hosted by each company. If it turns out there isn’t a representative for your particular college, you’ll have to find contacts other ways. After the informational program, potential interns will submit a resume for screening, and will then complete multiple rounds of – rather intensive – case interviews. Summer internships typically last 10 weeks, and can be the best path to an offer – Bain states that a “majority” of those who complete an internship will receive a full time offer at the end of the summer. This results in full time offers peaking in the autumn months. Some tips for turning your internship into a full time offer include: being meticulous in your work, networking as much as possible, building a relationship with your case leader, and always asking for feedback. Men in consulting account for about 3/4ths of full time positions, which is slightly higher than the average gender distribution in MBA programs. Despite the fact that women account for 55% of undergraduates, they represent 40% or less of MBA students. Schools are investing in scholarships and outreach to increase female enrollment, which may lead to a more even distribution in consulting. Satisfaction is high among the women currently holding MBA positions in consulting, and their view on company culture is actually better than men’s. Women ranked culture at 7.7 out of 10, while men on average felt culture deserved a 6.8 out of 10. Work is also equal amongst all employees, as the average number of hours worked and time spent traveling are nearly identical for men and women. Most MBA jobs in consulting carry the title of either “consultant” or “associate”, and there are few positions in non-consulting functions such as HR or project management. MBA degrees are increasingly being used as a career pivot, and 87% of MBAs enroll in programs to switch their job function or industry. MBA students who use their degree to switch to consulting will enjoy compensation increases of 114% on average, depending on what function you are currently in and the compensation you already earn. Based on the satisfaction scores seen in MBA grads, it’s no surprise that almost half of all pre-MBA consultants remain in the industry after earning their higher degree. However only 1/3rd of MBA consultants still work in the field after 6-8 years. Some of these transitions from consulting may be a result of firms, such as McKinsey, put their employees in touch with outside firms who have vacancies that are well suited for their own consultants. Why would consulting firms be so willing to help their talent leave? They believe it makes their firm a more attractive to potential employees, and the constant talent churn can bring fresh ideas and talent to the office. The most prestigious firms in consulting are so well known that they can forego advertising and flaunting their name and status, simply because everyone already knows them. While you may already have your sights set on these top dogs, there are plenty of smaller management consulting firms with fantastic reputations. To see a full list of consulting firms that hire MBAs, along with their average compensation packages and satisfaction scores, simply sign up for free and visit the Consulting Dashboard. There’s no denying the size and popularity of the consulting industry for MBAs, but how far does the influence reach? Some observers believe that the hiring power of large consulting firms from MBA programs actually allows them to actually alter curriculum to their current and future needs. So what are consulting firms hoping to see from fresh MBAs? The head of global recruitment at Boston Consulting Group would “like MBAs to learn more about organizational dynamics and the science of decision-making. That would help clients absorb the work we do and change their decision-making for the better.”.